DRESSINGS and SEASONING’S to foods is what make-up is to your face. The wrong types can make you look cakey and fake. Similarly, the wrong choice of toppings to your foods can mask the benefits of your salads, soups or sautéed veggies. Now the next question rushing through your mind would be: So what’s the swap? I agree sometimes the condiments make the meal; but the wrong ones are not at all goal friendly. These 6 swaps can help you slash the fat content and boost nutrients — without sacrificing the flavours ! 1. EAT THIS : Avocado / Nut butters , NOT THAT : Butter . Let’s go natural and explore the benefits of Nature’s butter: Avocado. Factory made butters can mean a lot of saturated fat, sodium and preservatives. The avocado fruit is loaded with good fats (heart healthy) called MUFA’s. Plus it has loads of Vit E (anti-oxidant) and Potassium (important for cardiac health and muscular contractions). It also can help to de-bloat since it acts as a natural diuretic. All nuts are rich in omega-3 fatty acids so grinding them can give a buttery texture. Make them into a paste with a slight drizzle of olive oil, sprinkle some Himalayan pink salt/Kosher salt and Voilà ! Walnut, peanut, almond, cashew, hazelnuts. you just name it! USE: Spread it on your whole wheat toast, add a dollop of it to oatmeal and enjoy the creamy goodness knowing that per tablespoon, it packs 3/4 fewer calories. You could even take a tablespoon of it to stave off afternoon hunger pangs. Is it the white creaminess of mayo that makes you reach out for that jar ? You must try Hummus. This switch results in half the fat for double the amount and since its made from garbanzo beans and garlic, it can boost your intake of protein, minerals and antioxidants. What more? Add some cilantro or mint leaves for some flavour. You will seriously forget mayo. Or, blend yogurt, lemon juice, pepper and spices. Yogurt provides a smooth, creamy consistency and it easily absorbs flavors you add to it, so a spoonful or two is sure to be delicious. Its rich in gut friendly bacteria, protein and calcium. Something that the mayo missed out on. USE : Try it on an open faced sandwich , a whole wheat wrap or as a dressing to a salad. There is a bonus over here. 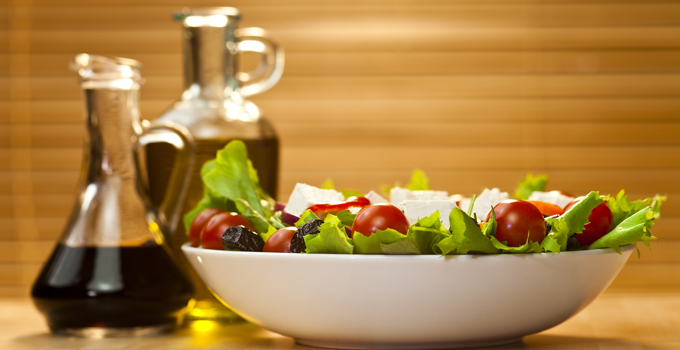 Vinegar has been shown to control blood sugar levels and curb fat gain. The pectin content in it makes you feel fuller for longer. Feel free to add variations like: apple cider vinegar, balsamic vinegar, rice vinegar, wine vinegar. It all becomes even more interesting with the addition of herbs, spices and flavourings. Ginger, garlic, basil, oregano, dill, black pepper, mint and mustard are all perfect examples. USE: Drizzle it on your salads, marinate the veggies and roast them , in sautéed vegetables , add them to soups. 4. EAT THIS :Spicy Mustard / Home-made Salsa , NOT THAT : Ketchup. Let us strictly say NO to ketchup. Each tablespoon packs about a teaspoon of HIGH FRUCTOSE CORN SYRUP aka Refined Sugar. It’s said that one fourth of a bottle of ketchup is sugar. Ketchup lovers.. Hope you are listening? Kick up the flavour with Mustard (commonly Dijon mustard) . The presence of cancer fighting anti-oxidants similar to the ones present in broccoli or cabbage is like an added feather. Salsa are typically made of tomatoes, onions, chilies and cilantro. It’s rich in cancer fighting lycopene. You can easily make a large batch and let it sit in your fridge for a couple of days. USE: It’s actually a part of Mexican cuisine, but goes well with sandwiches, lentil pancakes , vegetable dips. Not even kids! This one again has a LOT of sugar and preservatives. Cook the fruits from your favourite jams, such as strawberry, apple, guava, in a saucepan at medium heat with water. Add water if you want a spreadable purée. Use fresh mint, lemon rind, cinnamon or nutmeg to enhance flavours without adding sugar. USE : It can be used very much like the jam, in between breads , as a flavour to yoghurt , breakfast cereals, etc. Crave for that CRUNCH ? Whether they’re whole-wheat or white, baked or fried, croutons don’t offer much nutritional value. Only fat and bad carbs. Try tossing crunchy veggies like bell peppers (best if coloured), celery, carrots strips or heart-healthy nuts and seeds. Seeds can be anything like, sunflower, flaxseeds, sesame, pumpkin , watermelon. USE: Croutons are generally add-ons to salads and soups. So next time you hit the salad bar, skip the croutons (even if it says ‘whole-wheat’) and ask for some nuts/seeds. This is what I could put up together. I mainly emphasise on Soups, Salads and Whole wheat toasts, since these are trending at the moment in the quest for something healthy to eat when we go out. Sadly, the Sauces and Seasonings block their nutritional punch and make your efforts go down the drain. So let these swaps still keep you in love with lettuce and at the same time tantalize your taste buds. Disclaimer: People with nut allergy do not try the salad dressing and salads that contain nuts. Very informative and few observations were eye opener.